"Of brilliant intellect and unflagging energy, versatile, inspiring, quick of wit, warm of heart, neglecting no duty inherited or undertaken, she was to the end faithful to her trusts." Image courtesy of the Cooper-Hewitt National Design Museum. Sarah Cooper Hewitt, known as "Miss Sally," was born in 1859, the second child of Abram and Sarah Amelia Hewitt. She was known for being highly intelligent, innovative, decisive, and outspoken. Sarah was very well educated, having access to private tutors at home, attending Miss Torrey's School in New York City, and finally Miss Porter's School, a finishing school in Farmington, Connecticut that was noted for its conservatism and thoroughness. Later, while the family was traveling abroad, she was tutored by the family's private French teacher. Because of this instruction, she eventually became fluent in that language, a skill that would help her greatly in her travels to Europe. Throughout her life, Miss Sally was known for teaching herself about a variety of subjects. Her involvement in educational institutions was also substantial. She made many financial contributions to Cooper Union and several schools around Ringwood. In addition to this, she was the first woman to serve on the school board of Pompton, New Jersey. Sarah Hewitt. Image in Ringwood Manor collection. Sally Hewitt had a variety of interests and seemed to excel at all of them. As a young woman, she was quite athletic and was a noted equestrian. She thought nothing of riding around the rugged property of Ringwood un-chaperoned as a young lady. Later, she commissioned the Brewster Carriage Company to custom-build various carriages to her specifications. Often, these custom changes would allow the carriages to go faster, turn sharper, or ride more smoothly. Her knowledge of riding and local roads later led her to write an article entitled "Some Suggestions for Repairs of Country Roads." The article was based on her experience with roads on the Ringwood estate and it was reprinted in various agricultural journals and the popular magazine Harper's Weekly. She also shared her grandfather's appreciation of fine craftsmanship and the emerging industrial society. Miss Sally once entered the blacksmith shop at Ringwood Manor, hammered out her own horseshoes on the anvil, and affixed them to her horse. Miss Sally Hewitt never married, though it has been said she had a variety of male suitors who wanted to marry her. She preferred to pursue all her interests to the fullest and was determined to make her own decisions. Following the death of her parents, Miss Sally and Miss Nellie inherited the New York City residence, Ringwood Manor, and the Reverie Cove property in Bar Harbor, Maine. Sally undertook the management of the Hewitt-owned residences, overseeing the construction of stone walls and the maintenance of structures. She also managed a restaurant in New York City that used products from the Ringwood Manor estate. 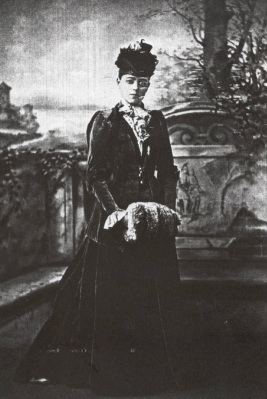 Sarah in costume for the 1883 Vanderbilt Ball. Miss Sally was co-founder of what is now known as the Cooper-Hewitt Museum. The museum opened informally in 1895 as the Cooper Union Museum for the Arts of Decoration. It was a gallery on the fourth floor of Cooper Union in New York City, which housed collections of the sisters and their friends. The purpose of the museum was to make all of the pieces accessible to students, scholars, and collectors. Sarah and Eleanor were hands-on in daily museum work. They would arrive early and plunge into the filing, pasting of pictures, and any other task that would be inspirational to designers and students. The museum collection was later moved to the Carnegie residence in New York City. As a result of her involvement in the museum, the French government gave Sally the Honorary title of "Officer D'Instruction." Other honors included "Doctor of Humane Letters" from New York University, and she received the President's medal from The Architectural League of New York. Her philanthropies also included her continual support to Cooper Union and a variety of other museums in the New York region. Hewitt Brewster laundau. Image courtesy of the Henry Ford Museum. In August of 1930, just before her death, Miss Sally donated most of the family's carriages and riding equipment to the Henry Ford Museum in Dearborn, Michigan. Originally, she was intent on donating her collection of carriages to the American Museum of Natural History. Her request was denied due to the lack of space. Mr. Henry Ford graciously accepted the offer and had Miss Hewitt's items shipped quickly. Today the Henry Ford Museum has a portion of the collection Miss Sally donated.